After the deer demolished the sempervivums in my gardens, the one I most wanted to replace was a strange-looking little sempervivum called Oddity. It forms a rosette like the others, but instead of the leaves being flat, they are open green tubes tipped with red. 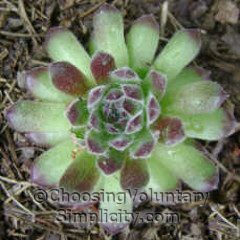 The local garden center didn’t have any sempervivums and had never heard of Oddity, so I started searching online. 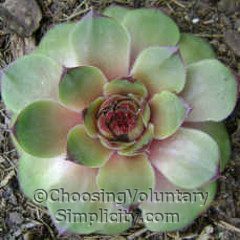 One company seemed especially promising… a family that had been in the nursery business for generations and specialized in sempervivums. I was impressed by the wide variety they offered, many of which I had never even seen before. And they did have Oddity. I wrote to the owner a couple of times and received prompt, super-friendly answers back. When I inquired about Oddity, she told me that the Oddity plants were especially large and beautiful this year. 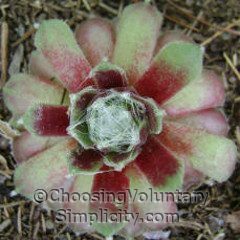 The sempervivums were priced per pot. 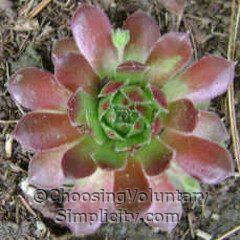 When I asked how many sempervivums I could expect to receive in each pot, she told me I would receive one well-rooted rosette and at least two or three baby “chicks.” I decided to place an order. When my order arrived, it was a huge disappointment. 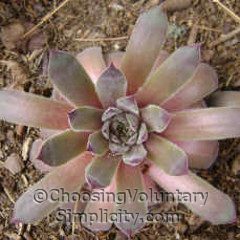 The rosettes were astonishingly tiny and two-thirds of the pots fell short of the promised “at least two or three baby chicks.” Most of the “big rosettes” I received were dime-sized or smaller, many pots had only one rosette and no chicks, and they all were in terrible condition. There was a return policy, and I could have tried to return the plants, but these were all varieties I couldn’t buy locally, and I knew from years of experience growing sempervivums that I could probably bring most of these poor specimens back to health. I did, however, feel that I deserved to receive the number of plants I had paid for, so I wrote again to the owner of the company, mentioning my disappointment that so many of the pots contained only one tiny rosette… on the off chance that the owner might not be aware of the number and condition of the plants being sent to their customers. The answer I received was no longer super-friendly… obviously she was very aware of the poor quality of her plants and the lack of honesty in her advertising… she just did not care. The e-mail ended with a perky “have a nice day” followed by a full line of exclamation marks. Her attitude made me mad! So I took photographs of each of the pots and the sempervivums in them, making sure that each label could be easily seen. 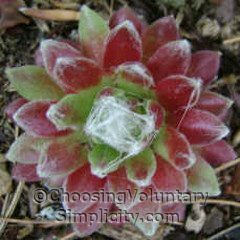 Then I wrote up a list of the sempervivums I had ordered and the number of chicks I should have received but didn’t. And then I wrote to the woman again, and I told her I had taken the photographs and made the list, and that I would be sending both… plus copies of the e-mails she had sent to me describing the number of plants I would receive… to my credit card company to dispute the charge because I had not received the sempervivums I had paid for. 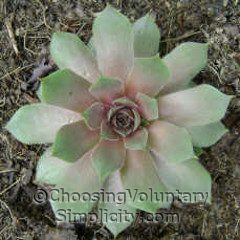 I knew the truth was on my side, and the woman obviously knew it too because later that same day I received another e-mail curtly telling me that I would be receiving the missing sempervivum chicks by Priority Mail. They arrived a couple of weeks later packed in plastic bags and in as bad condition as the previous order… several of the chicks had been squashed absolutely flat. It was almost amusing that the number of baby chicks they sent brought the chick total only to the minimum figure the woman had promised. I have been giving the tiny rosettes and the even tinier chicks special attention for several weeks now, and I think they are starting to show signs that they are settling in and starting to thrive. Mostly I’m hoping they will live. I have high hopes for them all… except for the sempervivum I wanted the most, the Oddity. The Oddities they sent me are so tiny and immature. Right now they look hopeless, but perhaps they will come along too… eventually. I hope so. I thought that would be the end of my sempervivum purchases, but then the person we had spoken to at the local garden center called to say they would be able to special order sempervivums for us after all if we were still interested. We needed to meet a minimum, but that wasn’t a problem because there were so many interesting varieties available… including the Oddity I still wanted but had almost given up on. Unfortunately, even though we ordered three pots of Oddity, they did not arrive with the rest of the order and they tell us they are “no longer available.” I’m disappointed not to have the Oddity, but I am very pleased with the quality of the plants from this special order (shown in the photographs below). At this point I’m still learning which name goes with which sempervivum… but I think they’re all beautiful! I am so sorry that you were dissappointed in the first order! Some people do business that way. I will be surprised if they stay in business for long! The second ones are indeed beautiful. I like sempervivums too. Way to go girl, I’m glad you stood up for yourself and made that woman send you the plants you paid for. Your special ordered semps are beautiful. I can never understand how companies think they can stay in business when they treat their customers that way. Hasn’t this nursery ever heard of terms like customer satisfaction and word of mouth advertising? You did exactly the right thing in not giving up until they had lived up to their end of the bargain. It’s just a shame that it turned out to be such a bad experience. You can file this one under “You learn something new every day” — I just came to your blog for the first time today, clicked on the link for this post, and read it. What a coincidence! I have some sempervivum in my garden that were given to me by my aunt. 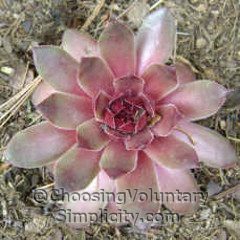 I think they’re really unusual and pretty because they don’t look like other sempervivum, instead of flat leaves their leaves are tubular. But I’ve never known what the name of the variety was until today — Oddity! Thanks for the timely info and the entertaining read. Great blog BTW. This sounds like so many companies i have dealt with lately from some large “box” stores to our local cable. You did the right thing. It is truly sad that companies really have little customer service and seem to forget that we MIGHT have been repeat customers except for their poor service. It looks like your local spiders love these plants as well! I hope your Oddity plants thrive. 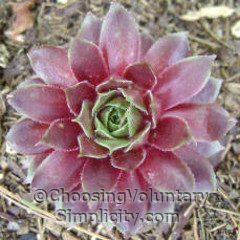 I’m glad you persevered with your collection – Sempervivum are well worth the trouble. By the way, ‘Oddity’ is a bit more of a challenge to grow successfully, so that explains why you have had such trouble getting a supply of them. 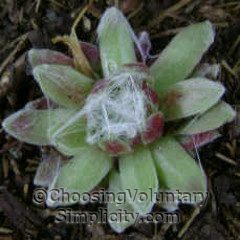 Dionne, what looks like spider webs on those sempervivums is actually part of the plant. Sometimes the webbing gets very thick and fuzzy… I love these! I hope you sent her a copy of your column….